Lowongan Kerja PT Astra Honda Motor - AHM or later known as Astra Honda is the brand holder of Honda Motorcycle in Indonesia. AHM is recognized as the largest automotive motorcycle manufacturers in the world. 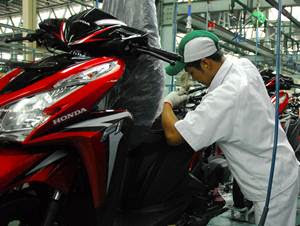 Headquartered in Jakarta, Astra Honda Motor installed total production capacity of 5.3 million units per year (as of December 2014) through its 4 production facilities in Jakarta and Karawang West Java. PT Astra Honda Motor is a multinational joint venture established by Indonesia's PT Astra International Tbk (Astra Group) and Japan's Honda Motor Co, respectively 50% and 50%. In 2014, PT Astra Honda Motor succeeded in posting overall improvement in its performance. PT Astra Honda Motor closed 2014 with a remarkable performance achieving total sales of 5.1 million units, an increase of 8% compared to 4.7 million units in 2013. Minimum S1 majoring in Mechanical Engineering, Industrial Engineering and Electro Engineering. Last semester students are welcome to apply. Minimum GPA of 2.75 out of 4.00 scale. Able to explain the manufacturing process. Good understanding about engineering drawings. Good understanding about the demands of the quality of each process. Have a good team work abilities. Minimum S1 majoring in Mechanical Engineering, Industrial Engineering. Last semester students are welcome to apply. Able to read engineering drawings well. Have a strong motivation to perform improv. Minimum S1 majoring in Mechanical Engineering. Last semester students are welcome to apply. Good knowledge about the various methods of testing. Glad to improvise and have good analytical skills. Minimum S1 majoring in Mechanical Engineering, Industrial Engineering, Statistics and Communication Studies. Last semester students are welcome to apply. Strong interest in the field of Advertising and Promotion. Minimum S1 majoring in Aerotechnics, Materials & Metallurgy Engineering, Mechanical Engineering. Last semester students are welcome to apply. Good knowledge about the techniques of measuring, testing and motorcycle driving techniques. Good knowledge about the fixture design techniques. Minimum S1 majoring in all majors. Last semester students are welcome to apply. Have the ability to analyze problems and problem solving to include real data.